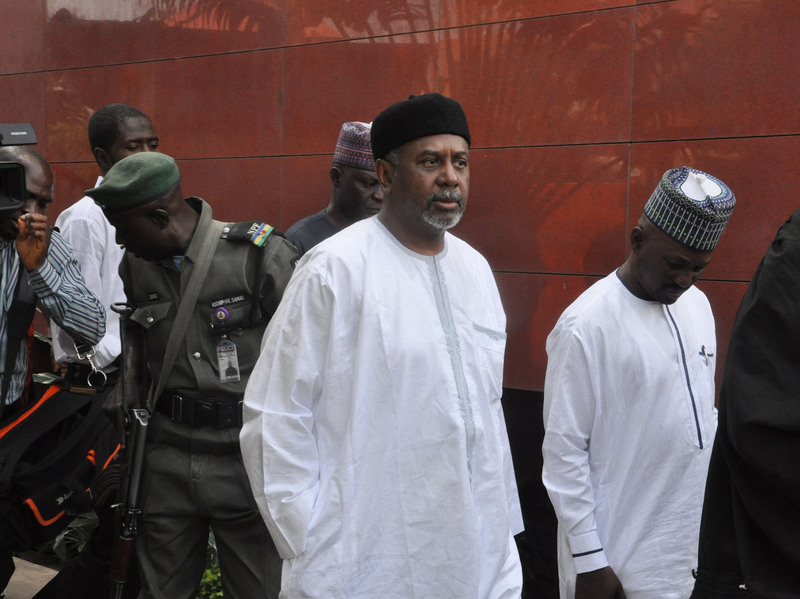 Nigeria's former national security adviser Sambo Dasuki (center) arrives at the Federal High Court in Abuja on Dec. 14 for a hearing on charges of possessing weapons illegally. Nigeria's former national security adviser, Sambo Dasuki, is on trial accused of money laundering and breaching the public trust. President Muhammadu Buhari, elected in March, alleges that Dasuki stole staggering sums and, in doing so, crippled the Nigerian military in its fight against Boko Haram — the Islamist insurgents notorious for their violence and for kidnapping hundreds of Nigerian schoolgirls. The trial of Dasuki is a cornerstone of President Buhari's campaign against high-level corruption. Armed soldiers arrived at Dasuki's home earlier this month and took away five bulletproof cars and seven assault rifles, and arrested the former national security adviser for having them. Dasuki, who served as national security adviser to Nigeria's former President Goodluck Jonathan, isn't only accused of hoarding his own weapons. He is also accused of stealing more than $2 billion from the military when he was supposed to be supplying it with weapons. According to one active-duty Nigerian soldier who fought against Boko Haram and was shot through the knee, he and his men were so short of resources that their weapons didn't have bullets. Their trucks didn't have gas. "We had so many casualties," the soldier says, speaking on condition that his name not be used. "There wasn't fuel in the vehicles. The commanders came out categorically telling us that there's no fuel and they don't have money." No fuel and no money — and almost no ability to fight Boko Haram. One year ago, Boko Haram militants controlled an area the size of Belgium. In Nigeria's northeast, thousands of Nigerian civilians were dying. But this soldier and many others were so outgunned, they fled. "You will see the Boko Haram, your man will start thinking, can I face them? Or I should find my way out? Because without those supplies we are doing nothing," the soldier says. At the time, Dasuki was in charge of weapons procurement — and it appears he had money for the arms and ammunition. An official government document obtained by NPR shows a money transfer request by his office for $47 million. A senior Nigerian official tells NPR all the money left the Central Bank in cash, at night, in armored vans. I asked Bolaji Owasanoye, who helps lead Buhari's anti-corruption committee, if there is a belief that the former national security adviser took money intended for the frontline troops fighting Boko Haram, and instead channeled it elsewhere. "This is the allegation," he said. "And it remains an allegation until proven. However, as they say, there is never smoke without fire." Nigeria's "security forces have been weakened," Owasanoye said. "There's no doubt that that situation is strongly linked to corruption. Corruption weakened and escalated our insecurity. Because money that was appropriated for weapons, for welfare, it wasn't getting to base. And if it wasn't getting there, how are you going to fight insurgency?" Dasuki has pleaded innocent and declined to be interviewed. His lawyer, Raji Ahmed, told me, "The procurements were made at the request of the military." He insists his client was acting with the approval of the former president. But the new government says Dasuki can't get away with shifting the blame. "It is no longer business as usual," says Owasanoye. "Those who have looted public funds are going to be prosecuted. And those funds are going to be recovered. And the matter is being closely investigated so we don't get back to that situation." In the past nine months, the Nigerian military has purchased new weapons and, with the help of neighboring countries' armies and foreign mercenaries, it's retaken territory from Boko Haram. But the Islamist insurgents still launch deadly attacks. This is why President Buhari says unless Nigeria kills corruption, corruption can kill Nigeria.